Known as Blu-ray Disc, Blu-ray is the name of a new optical disc format developed a few years ago. This disc format was produced to allow people record, rewrite and playback of HD video, and storing large amounts of data makes it become different from others. The format provides more than five times the storage capacity of traditional DVDs. What’s more, this extra capacity combined with the use of advanced video and audio codecs will offer consumers an unprecedented HD experience. For some people, they often go outside that they don’t have enough time to watch a whole movie in the house. So, they want take Blu-ray movies with them and enjoy movies whenever and wherever. Let’s take Asus Eee Pad Transformer for example, how can we load Blu-ray videos to Eee Pad and play Blu-ray movies on Transformer? I suggest to transcode Blu-ray movies to Transformer, because you can not directly play Blu-ray movies on the Transformer. The first reason is that Eee Pad does not have BD ROM for you to read and play Blu-ray movie files. And the second reason is that the video decoding capability of your Transformer is not powerful enough to decode the Blu-ray HD video codec. So, you need Mac convert Blu-ray movie to Transformer with your MacBook or iMac. What do you need? Pavtube Blu-ray Ripper for Mac is supposed to be the most useful Mac Blu-ray to Transformer converter. It combines Mac Blu-ray movie player and Mac Blu-ray movie edtor with the function to rip Mac Blu-ray for transformer playing. Besides, the program allows you batch rip Blu-ray movies on Mac. Step 1: Getting started and select HD MP4 as output format. The Blu-ray to Transformer ripper on Mac allows users clicking the format bar to select output format. To Mac rip Blu-ray to Transformer, you need follow “HD Video”> “MPEG-4 HD Video (*.mp4)”. Step 2: Customize video and audio settings. 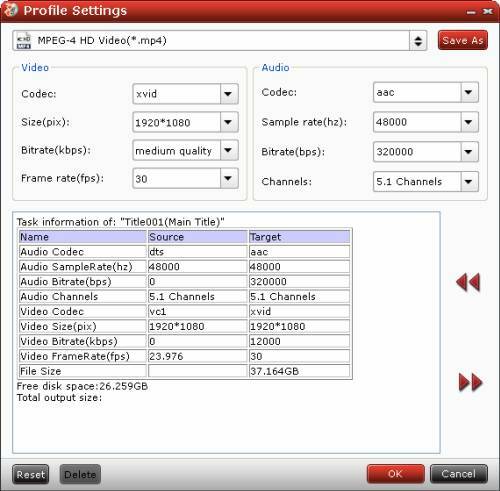 The program enables users to adjust video and audio settings when converting Blu-ray movies. Click “Settings” button, then you are able to adjust video and audio parameters on the following popup window, including codec, size, bit rate, frame rate, sample rate, and audio channel. Step 3: Convert Blu-ray to HD MP4 video. 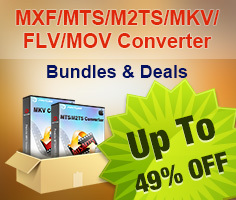 Click “Convert” button to start converting Blu-ray to HD MP4 video. When the Blu-ray ripping task on Mac is finished, you can click “Open” button to get the converted HD MP4 files for Transformer playing with ease.